In the 2001 Disney comedy, "THE PRINCESS DIARIES", Anne Hathaway plays a high school student who finds out that she's actually the princess of the fictional kingdom of Genovia. The story is supposed to take place in San Francisco. But of course it's all Hollywood magic, and most of the scenes were really shot in and around L.A. When Anne visits Julie Andrews at the Genovian Consulate, the filmmakers actually shot those scenes at the historic Doheny mansion, on the campus of Mount St. Mary's college, at 8 Chester Place, near downtown Los Angeles. The interior scenes of the lavish marble ballrooms were also shot inside the grand mansion. The gardens surrounding the buildings were also used in the film. In fact, this beautiful private campus is often used for fiming. Recent productions shot there include the 1999 Mel Gibson movie "Payback", the 1998 HBO movie "Winchell", the PBS Masterpiece Theatre version of "Song of the Lark" and episodes of the TV series "Sliders", "The Profiler," "Gideon's Crossing", "Agency" and "Gilmore Girls". Also, the Doheny mansion is located right next door to St. Vincent de Paul church, which was featured prominently in Arnold Schwarzenegger's thriller, "End of Days". The church was built by Doheny. Remember Mia's private school, Grove High? Well, those high school scenes were actually shot at a private Catholic girls school called Alverno High, which is located at 200 N. Michillinda Ave., in the small city of Sierra Madre (just northeast of Pasadena). 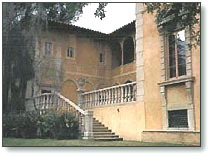 One notable building on the campus is the Villa del Sol d'Oro, a replica of a famous Villa in Italy which legend holds was designed by Michaelangelo. And what about the old firehouse where Mia and her mother lived? Exterior shots were in San Francisco, but the interiors (where she slides down the fire pole) were a set, built inside a sound stage on the back lot of Walt Disney Studios in Burbank. The same Stage 2 where "Mary Poppins" was filmed. What about that beach party scene? The one where 'Lana' (Mandy Moore) sang a song and the press harrassed Mia with a helicopter? That was supposed to be Baker Beach in San Francisco, but actually almost all of those scenes were shot on a stretch of Zuma Beach, in Malibu, CA. 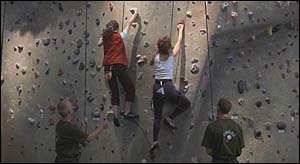 So what about the "Rocks Around the Clock", that indoor rock-climbing-wall place where Mia worked part time, and where Mia and her mother talked about Mia meeting her grandmother, while both were suspended in mid-air? That was shot in the L.A. area too, at the The L.A. Rock Gym, located at 4926 W. Rosecrans Ave, in the city of Hawthorne (which was the home town of The Beach Boys, by the way). "The Fast & the Furious", "Pearl Harbor", & "Mulholland Drive"
* Locations marked by an asterisk (*) may be located in areas with high crime rates.